Collaboration is commonly defined as “working with others to do a task and to achieve shared goals”. To collaborate effectively on a project, all people involved in the project should have direct access to an up-to-date project plan. However, this is not typically the case. Only the final schedule is shared through static reports and charts, and these very quickly get out of date. In these situations, any change to the plan means the project schedule needs to be updated, reported on, and the reports redistributed to stakeholders. This is difficult and time consuming, which means the schedule update is often late or missed altogether. When an unforeseen event causes another change to the plan, this inefficient cycle continues. On January 21, 2016, Collaboration was released in GamePlan. Plans can now be shared with all project stakeholders. You share plans with others by entering their email address, what they are allowed to do to the plan, and a personal message. GamePlan sends an email notification and adds the plan to their Shared Plans list. There is no limit to the number of people with which you can share a plan. 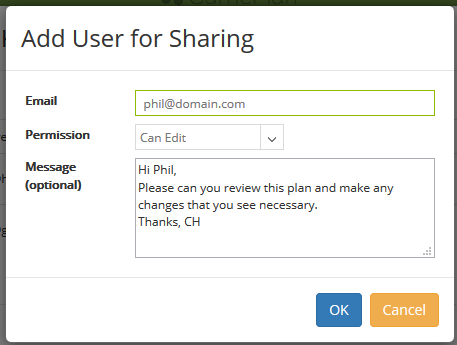 GamePlan shows you who the plan is shared with, what their permission level is, when the plan was shared with them, and when they last opened the plan. When a plan is shared, people can connect to the plan at the same time from anywhere. One person at a time is allowed to make changes to the plan. People connected to the plan can see who else is connected and who is the current editor. Editing permission can be handed off from one person to another. Additionally, a person who is viewing a plan can take over editing, in the event that the current editor has left the plan open and is away from their computer. This new functionality allows you to effectively collaborate on a project with all project stakeholders. Visit www.gameplan.global for a 30 day free trial. Thanks Will. If you liked the site, you’ll love the software! I encourage you to try GamePlan and let us know what you think.